Color-Enhancing Equine Shampoo naturally enhances dark tones within the mane, tail, and coat while providing deep-cleaning to leave your horse soft, smooth and shiny. 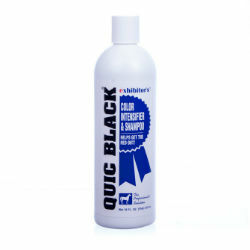 Quic Black optically alters the way light interacts with each hair shaft. Is is absolutely stunning for blacks and browns and all rich, ebony shades while subduing unwanted red tones. Restores color to clipped or sunburned coats. Excellent stain remover with no harsh chemicals or bleaches and has a neutral pH. Removes scurf with deep-cleaning, easy-rinse formula. 16 oz. bottle is sold by the unit or in case lots of 12.